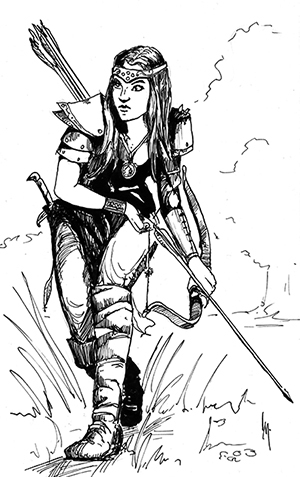 Today we present a new archetype for the 5e Ranger. This archetype focuses on the favored terrain concept. The scout archetype takes favored terrain to a whole new level. All ranger’s gain the favored terrain ability, However, the Scout becomes a true master of their chosen terrain learning to use it for deadly advantage. Other rangers might focus on fighting or working with animals, the Scout focuses on mobility and stealth. Master of their Environment – At 3rd level your favored terrain abilities improve as follows. – Stealth and Perception checks are with advantage even when traveling at a fast rate. Set Ambush – At 7th level, you gain the ability to establish an ambush. When you establish and ambush, you gain one round of free actions before anyone else rolls initiative. Once you use your ambush combat returns to normal. To establish an ambush you must be alone and hidden. Establishing an ambush requires a minimum of two rounds of preparation. Running Fight – At 9th Level when you are fighting in one of your favored terrains you may double move as a single action. You may only do this once per an encounter. Improved Ambush – At 13th level your ability to ambush enemies improve. When you establish an ambush you gain two rounds of free actions before anyone else rolls initiative. To establish and Improved Ambush you must be alone and hidden. This action requires one round to establish the conditions for the ambush. Teamwork – At 17th level your group can establish an ambush with you. The entire group uses your stealth roll to hide. While you still are allowed two free rounds of actions, everyone else is only allowed one. As mentioned above, feel free to give this a bit of a play test. I think it’s balanced but I might be wrong and would like to know if I am. Until next time Happy Gaming. ← A look at Game design: Learning to Accept Criticism.